This is an excellent idea from Sharp’s brewery — tasting notes on the beer glass. It has taken us ages to get decent beer glasses in this country, and long gone thankfully are the days when your only special labelled pot (Guinness) was used to serve bitter in. 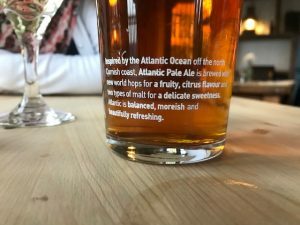 So, take a sip of Atlantic (a percentage of every sale goes to the RNLI) and then read the notes to find out what a lovely pale ale might taste like. Then see if you agree, children!